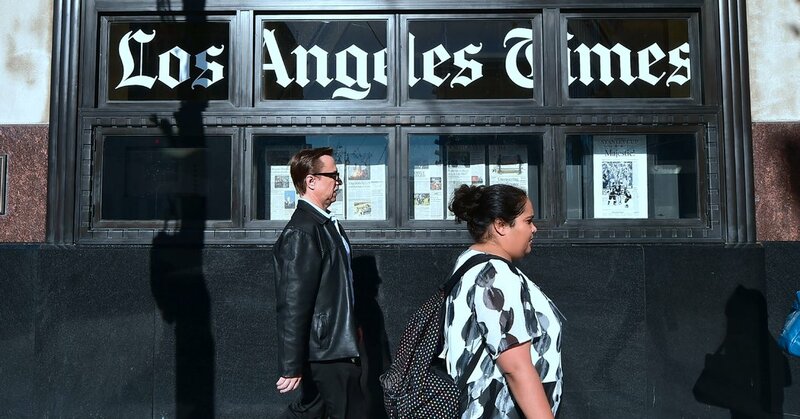 The Los Angeles Times said Tuesday that it would resume publishing a stand-alone print section dedicated to food, and that it had added new staff members to fill its pages. The moves come as a rare bright spot in a season of layoffs and consolidation in American journalism. The newspaper ceased printing a food section in 2012, and folded its food coverage into the Saturday paper as part of a painful decline that has persisted through much of this century. Last year, Patrick Soon-Shiong, a billionaire surgeon and medical entrepreneur, bought the paper and installed the veteran newsman Norman Pearlstine as its executive editor. “We view Los Angeles as the nation’s food capital, and the print section, which will serve as a weekly digest of our daily coverage, is an expression of our determination to provide the world’s best, most authoritative and comprehensive coverage of it,” Mr. Pearlstine said in a statement on Tuesday. Changes to the newspaper in the past year have been rapid and remarkable, including rebuilding a food section that Ruth Reichl, a former New York Times restaurant critic, once edited and where Jonathan Gold, the Pulitzer Prize-winning critic, reviewed restaurants. Mr. Gold died of pancreatic cancer in July at age 57. His legacy will guide the new food section, said Peter Meehan, the New York writer and editor who is now the newspaper’s food editor. The new section will appear in April, and be delivered in the printed paper each Thursday, when the circulation is 474,129, according to a spokeswoman. (The Sunday newspaper’s circulation is 665,738.) The section is part of a larger push to increase food coverage on all platforms, including the web. New and reassigned editors and writers will help fill its pages. Andrea Chang is the deputy food editor for Mr. Meehan, who will divide his time between Los Angeles and New York. Ben Mims has been hired as a cooking columnist, and Genevieve Ko as cooking editor. Mr. Mims was the test-kitchen director at Lucky Peach, the food journal started by Mr. Meehan, Chris Ying and the chef David Chang. (It ceased publication in 2017.) Ms. Ko has long been a stalwart of food media, writing cookbooks with several notable chefs and producing recipes and editing for almost all the nation’s major food publications, including The New York Times. The Food section will also publish work by Gustavo Arellano, the author of the column ¡Ask a Mexican! and a features writer at the paper. In November, the newspaper named as its new restaurant critics Bill Addison, who had been the national critic for the website Eater, and Patricia Escárcega, a food reporter for The Arizona Republic who had reviewed restaurants for The Phoenix New Times. The paper has also hired an audience-engagement editor and is building a new test kitchen at its headquarters in El Segundo, Calif.
Mr. Meehan said he has been given wide leeway to cover the Los Angeles food scene the way he sees fit.